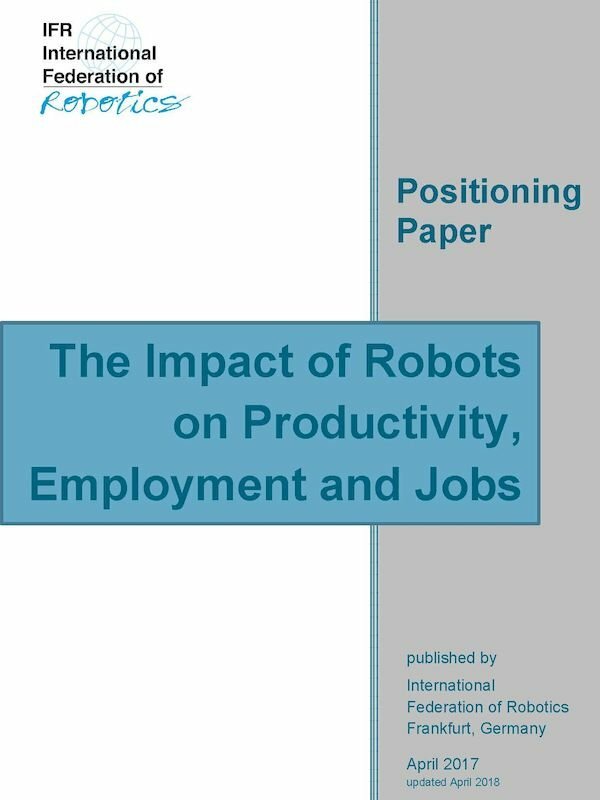 The Impact of Robots on Productivity, Employment and Jobs - International Federation of Robotics "
Frankfurt, May 03, 2017 — This paper provides the IFR’s opinion on the impact of automation - specifically of robots - on productivity, competitiveness and employment. IFR is not a policy institute. However, this report includes the main conclusions from a variety of experts on appropriate policy responses to ensure ongoing positive outcomes from automation and the ongoing development and uptake of robots, with which we concur. Driving the increase in public interest in robotics and automation is both a fascination with the potential of these technologies to change our lives, and a fear of the impact of automation – including robotics – on jobs. These fears are tied into broader geo-political and social shifts driven by issues such as trade policy and immigration that, overall, contribute to a sense of insecurity about the employment prospects of current and future generations. Consequently, many headlines focus on the potential negative outcomes of automation. This risks overshadowing the very real positive contributions of automation and robotics to productivity, competitiveness and job creation. In addition, it could undermine discussion and action on the measures that should be taken to enable countries, organizations, and individuals to reap the benefits of automation.